Epoxy grout is a material used in tiled areas regularly exposed to extreme conditions. Almost impervious to stains and water damage, it eliminates many maintenance and longevity concerns associated with tile. Epoxy grout has distinct advantages for those concerned with keeping grout in pristine condition. For other homeowners, the drawbacks may be too great to justify the additional cost and difficulty of using this material. Anyone who has spent time with a toothbrush cleaning and bleaching grout around ceramic tiles will be sensitive to the advantages of a grout that seldom stains. However, there are several other material properties that makes it a good choice for tiled areas. Stain Resistant: It is incredibly difficult to stain epoxy grout. Only certain chemicals and stains can permanently alter the color of epoxy. For this reason, tiled areas that are often exposed to grease or acidic substances, such as kitchen countertops, should use epoxy. Water Resistant: Unlike other grouts, water has little effect on epoxy. This is an incredible advantage after the grout has been installed. Longer shelf life: While most grouts cannot be stored for more than two years, epoxy can be stored for an almost limitless time as long as it does not freeze and is kept in an airtight container. No Sealant Required: Traditional grouts should be sealed every two to three years. Epoxy needs no additional sealants. Mold and Mildew Resistant: Epoxy is already somewhat resistant to mold and mildew, a property that can be enhanced when an additive is mixed in with the grout before application. With the advantages that epoxy offers, the homeowner may be surprised that this material still remains an oddity in many areas. However, a few considerable drawbacks makes many contractors reluctant to use this product. Quick Setting: Epoxy is difficult to use because of its quick setting time. Many contractors refuse to use epoxy grout, instead they use a common grout mixed with additives and heavily seal it. Expensive: Epoxy can easily be four times more expensive than other types of grout, even when the cost of sealants and other additives is taken into account. Discoloration: Epoxy can cause serious discoloration on porous surfaces, so the tiles must be sealed before the grout is applied. This is particularly important when stone is being used. Despite the inconveniences, for areas that regularly come into contact with water or substances that stain, epoxy is often worth the extra trouble. A homeowner can use epoxy without professional help if he has some experience grouting, is covering a small area, and has someone who can help finish the project.Begin by collecting all of the required tools. It is important to work quickly when using epoxy, so be sure that there are sponges and other tools for clean up within easy reach. 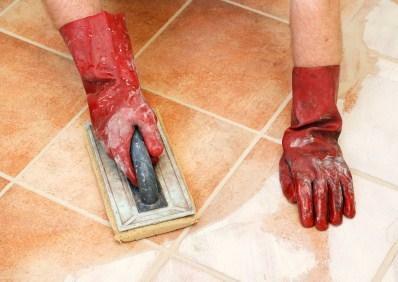 When applying epoxy, one person should use a trowel to apply the grout, while the other person follows and cleans the tile immediately after the grout is applied. When applying the grout, keep in mind that all of the epoxy must be mixed together at one time. When applying epoxy, the tiles should never be cold, so make sure the room is warm before beginning. Start by mixing the grout according the manufacturer's instructions. Using a trowel, spread the grout quickly over the surface of the tiles. As soon as a small section is finished, the other person should scrub the area to remove excess epoxy. Then the area should be cleaned thoroughly with a damp sponge. It is best to work in small sections where the grouting is completed, rather than attempting to cover a large floor area with epoxy and leaving the clean up for later. Some contractors recommend a final cleaning using a vinegar and water solution to remove any epoxy haze from the tile. It is important to realize that removing all of the excess grout is a difficult job due to the texture of the epoxy. Plan on doing several consecutive cleanings before proceeding to the next section of tile. Epoxy may be a difficult material to use, but many homeowners find that the advantages of this material exceed the problems that occur. Before hiring a contractor for installing ceramic floors, be sure to look at previous examples of the contractor's work. Many excellent tile setters have no experience with epoxy, so be sure that the contractor you hire has extensive experience working with the material to avoid dissatisfaction with the final product.